Part one of a landmark breathwork and meditation course from a Tibetan Buddhist scholar. Your breath is a gateway to the vastness of the universe—and the path to your highest fulfillment. 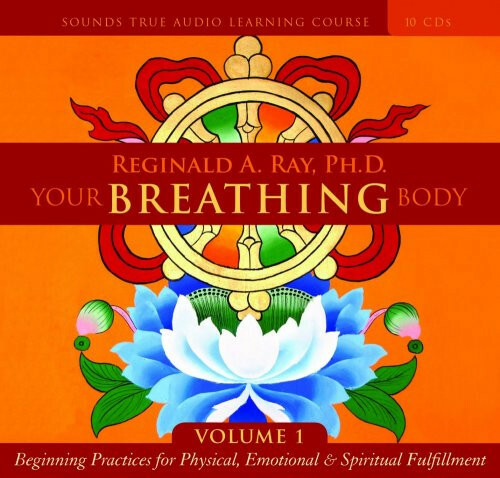 This is the premise behind Your Breathing Body, a landmark two-volume breathwork curriculum from esteemed meditation teacher and Tibetan Buddhist scholar Reggie Ray. Volume One presents a 10-CD course with the beginner in mind. Blending somatic practices and breathing techniques from cultures and traditions around the world, Reggie gives you a practice-focused program that will show you how to “fathom your breath to its full depths” for physical healing, emotional balance, and, ultimately, the direct experience of who you are and where you fit in the cosmos. I've worked with this program over and over for several years now, it really is the gift that keeps on giving. Reggie is impeccable in creating an accessible program of meditation that will help everyone. For total beginners it's the best first step you could have, and for seasoned meditators there's a lot to be gained in the somatic connection Reggie unfolds with his guidance. I have just completed this program and I am really impressed by how quickly and deeply all the protocols proposed here can help us to touch our innermost being. Reginald Ray is an incredible meditation teacher. His explanations are always very precise and clear, which helps you to understand exactly how and why you are doing the practices that he proposes. His instructions during the guided meditation also really help you to get into the relaxation and meditation moods. I have tried a lot of guided meditation programs, and this one is really the best one of all. Very concrete and simple to put into practice, but very profound and rich at the same time. Even though I have my personal meditation master, the work of Reggie Ray is the best present I gave to myself in years! I have only just recently been gifted Vol. 1 & 2 of Your Breathing Body, along with the book Touching Enlightenment and I am very grateful. First, for the synchronicity - it's time and place; and then the merits of having such a calm, down to earth, mentoring voice, cheering on what my heart has already been bringing me through to - wow! If you are interested in these teachings and would like more samples - do check out www.dharmaocean.org/ for a wealth of free introductory lessons and podcasts. At first, it took me awhile to get into this album. It felt very full of information. That's also the reason it is so stupendous. It is really chock-full of rare, good information. Reggie is a phenomenal teacher. I am going to get the 2nd album. The reason it's rare is that he goes into very specific areas of the body, for when we're in different situations. I love Reggie's teachings in general because of the specificities. He doesn't teach you to relax. He delves into the complexities and universalities of being human, and the gamut is infinite, according to him. It gave me a newfound respect for my body which complicates my life, because it forces me to re-prioritize. That's not an easy thing to do, but ultimately the best decision.